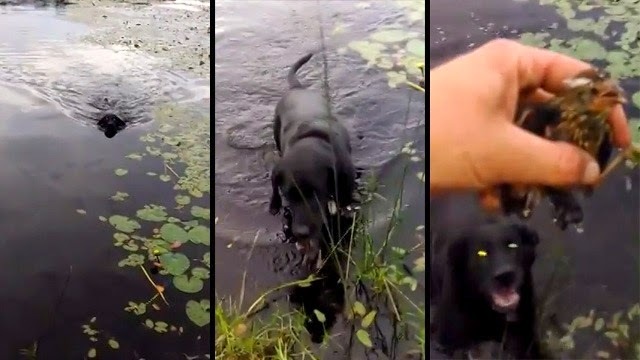 After spotting a distressed baby bird struggling to stay afloat, this hero dog named Jax jumped into the water and managed to save the day after grabbing a hold of the little guy. Jax picked up the bird in his mouth and managed to swim back to shore without injuring it. The lifeguard dog then gently drops the bird at the feet of his owner who picks up distressed animal. Rick Sauer wrote on Facebook, "I took my dog fishing with me after the rain yesterday and I walked by a tree baby bird flew out of his mask and landed in the middle of the pond! After 20 minutes of struggling I set my dog out after it the video explains the rest!!" Jax brought the bird back to land. Sauer told WFSB News that he placed the bird back in its nest and that its mother came back to feed it, unaware that his dog had just saved her baby. Responses to "Heroic Lab Saves A Drowning Baby Bird"